ESA’s anniversary DVD film “Hubble - 15 years of discovery” covers all aspects of the Hubble Space Telescope project – a journey through the history, the troubled early life and the ultimate scientific successes of Hubble. This portrait, directed by Lars Lindberg Christensen, contains large amounts of previously unpublished footage of superb quality. With more than 500,000 copies distributed, this DVD movie is probably the most widely available science documentary ever. Hubble's spectacular visual images make a stunning backdrop throughout the film, bringing an immediacy and vitality as the narrative reveals the new insights Hubble has inspired in all fields of astronomy from exoplanets to black holes. Complex though the science behind the telescope’s images often is, Art Director Martin Kornmesser has developed a unique style of elaborate 3D animation that enhances and vividly clarifies the underlying science. The movie is presented by an ESA scientist, Dr. Robert (Bob) Fosbury, who has himself used Hubble for his own research on many occasions. The 83-minute film DVD contains more than 60 minutes of bonus material and has narration in three languages: English, German and Greek. In addition, there are subtitles in 15 languages: Bulgarian, Danish, English, German, Greek, Spanish, French, Italian, Dutch, Norwegian, Polish, Portuguese, Russian, Finnish and Swedish. The film can be requested by TV broadcasters on Betacam SP or DVD without cost. This material may be used freely for shorter reports in the time leading up to the anniversary, but may not be broadcast in its entirety before 24 April. Note: the DVD is made in the European PAL format and will most likely not play on non-European DVD players. Computers, however, usually play DVDs in different formats without problem. 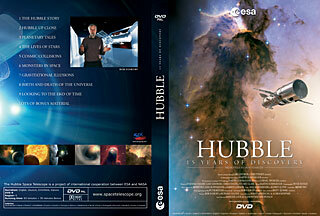 The DVD itself is on sale at the Hubble Shop. The full movie and individual clips are available for download here. The movie script is available here. The DVD covers in various languages are available for dowonload here. A few lines of the Russian subtitles in Chapter 2 03:34-04:04 are in English. A few lines of the Italian subtitles are in German. All subtitles in Chapter 6 stop at 2:20. To get them back it is necessary to wind forward a bit and rewind a bit. On surround systems the sound source may need to be explicitly set for mpeg audio. These issues have been corrected in version 2 of the DVD. "What's really surprising about Lars Lindberg Christensen's documentary is how it informs us while maintaining a solid wow factor: the first two chapters deal with the Hubble telescope's birth, initial near-sightedness, and its subsequent success in rendering jaw-dropping images of extraordinary beauty; everything else covers specific phenomena as exposed by Hubble's far-reaching optics, including quasars, black holes, specific galaxies, and fine details when the telescope was left wide open to collect deep space images over a ten-day period. [...] The ongoing narration by Fosbury and Howard Cooper is never short of potent explanations, making Hubble a good resource for space fans and educators. It's also a film worth revisiting, since Hubble will eventually reach the end of its lifespan in spite of a recent five year extension, and Christensen's doc is a fitting tribute to what's probably the most successful space device ever crafted, with images that will keep space eggheads busy for decades."